How to add Adwords Return on Ad Spend (ROAS) to a dashboard? One metric that is largely used by marketers is Return On Ad Spend (ROAS). 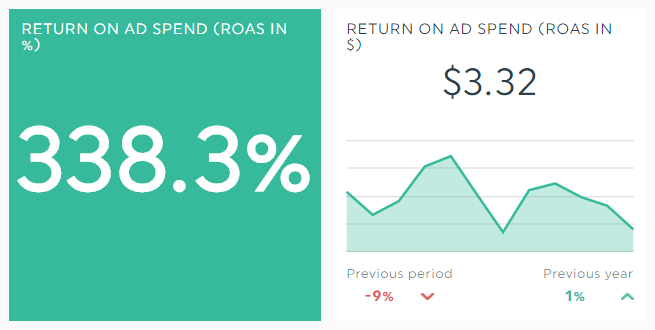 Unlike Return On Investment (ROI), ROAS isn’t a default metric in Adwords or Google Analytics. That’s why added the ROAS metric, so that you can complete your dashboard with this valuable piece of information. ROAS is calculated on ad spending only, while ROI checks for the total operating costs (manpower, marketing, R&D, etc). For online marketers, ROAS is easier to work with. Both can be expressed as a percentage (%) or currency ($), depending on what gives more meaning to you. This entry was posted in Integrations and tagged Adwords, Managing Integration. How to segment by Action in Facebook Ads? What are the definitions of Facebook Insights metrics?